Ever since I can remember I have been playing the empowerment game in one way or another. Writing stories, illustrating things, teaching, and training are all ways to empower others to understand, see, feel, or do something they weren’t able to a moment earlier. My goal as a teacher is to teach in a way that my students will no longer need me. It is only recently that I have begun fully realizing this about myself and have been energized by this realization. I have been on a quest of knowing myself, through personal development that has found me walking across hot coals, sitting with a Shaman on top of a pyramid in Mexico, screaming my darkest fears at the top of my lungs in a room of five thousand people, and traveling in silence by myself to many parts of the world. All of these situations have led to amazing experiences and breakthroughs that have had profound effects on my life. And yet the realizations are usually about something very small, that I actually knew the whole time. With myself, and with my students, empowerment breakthroughs aren’t about puffing yourself up. They are about allowing yourself to be exactly the size that you are… And loving yourself there. That’s the paradox of empowerment. It’s about vulnerability, not dominance. It’s about reality, not positivity. It’s about humbleness, not being better than someone else. It’s not, however, about self-deprecation or diminishing yourself in service either. How do I reconcile humbleness without being less-than, and being empowered without being greater-than? For me it is about embracing the emptiness that I am. After all, at the atomic level, I am mostly empty space! What makes me powerful is my ability to radiate my energy. I am nothing AND I am full of power. You are not nothing. You are not something. You are something else. Horses want us at our best. Horses need us to be clear. We often are a jumble of disempowering, judgmental, and contorted thoughts when horses really just want us to be. Plus there’s stuff we want to do and learn with horses! We need to get past our doubts and start living our dreams! I’ll get slightly less philosophical and more practical, and give you 7 Steps to Empowering Your Life. Step 1: Surround yourself with empowering posters, words, images. We all need a jumpstart. With all the bad news out there it’s a good idea to control what your eyes see when you wake up. Find an empowering poster or statement that you can read out loud. Put it where you see it every day. Have them on your phone so you can remind yourself at any time. Just know that this is not the final answer, and if you find yourself needing to plaster them everywhere like wallpaper, it is a red flag and you need to go deeper. Be careful not to use those posters as armor. It implies you feel the need to defend yourself against something and empowerment means embracing the strength inside vulnerabilty. Step 2: Be aware, change the language. Catch yourself making obviously disempowering statements and add “… Yet!” to the end of them. Changing a habit can be a challenge, so start with the easy stuff, (and this one is hard enough). Every time you hear yourself saying: “I can’t” add: “… Yet!” to the end of it. It will feel artificial. You won’t believe it at first, but hey, it’s a start! Say it anyway and love yourself for noticing and changing. You know the ones I am talking about. They are the ones that basically say: ‘I am powerful, it’s just that everyone else is too stupid to notice.’ People who's relationships have just ended, or who are feeling disappointed by others often find comfort in these types of quotes. It is not only passive aggressively mean to others, but it is mean to yourself, because the hidden message to yourself is that the only way for you to be OK is by making someone else less-than. That is an insult to yourself and will keep you disempowered. The solution is to make sure you are taking full responsibility for your role in whatever situation you are in. That is a true acknowledgement of your own power! Step 4: Fully admit when you feel disempowered. There is power in admitting the truth. Admitting that you feel disempowered does not mean that you aredisempowered. Admitting how you feel is telling the truth to yourself and you know what they say: The truth will set you free. (Maybe that’s the first poster you should hang up.) Later you can get to the business of figuring out why you feel this way, but sometimes just acknowledging our truth is enough. Some of my most empowering breakthroughs came from simply facing and stating, out loud, what I was reallyfeeling. You don’t have to say this to anyone else. Saying it out loud to yourself is enough. I feel small. I feel sad. I feel like a failure. I feel hurt. It’s OK. It’s the truth. I promise: If you strongly express what you are feeling, out loud, over and over and over again… Preferably really loudly and with full intensity… After just a couple minutes you will feel more empowered. Step 5: Celebrate! You just empowered yourself with the truth! It's a big step to be this honest with yourself. Step 6: Notice and turnaround Sneaky Disempowering language. This step is what I originally set out to write about. Sneaky Disempowering language can sabotage you and you won’t even know it’s happening. It makes you think you are being good to yourself. We all know the sneaky “I’ll try” trap where ‘try’ just becomes code for: “I know it’s not going to happen but I don’t want to admit it”. Watch out for the other Sneaky statements like: “I am really hoping I get to do that” or “I wish I could, but I just don’t have the time”. The universe listens and conspires to create the reality you ask for. Don’t be a hoping person. The universe will leave you with something you need to hope for instead of have. The sneaky dark side of hoping is victimhood and lack of responsibility. Do hope, but don’t hide behind it. Hope the best for others, and hope for yourself when it comes to things you truly can’t control. “I hope I win the lottery”, “I hope my leg heals in time”. For everything else: Make it happen. Do your best or admit you are not going to make it happen. By the way, it’s OK to do your best and still not achieve something. If you find yourself using ‘try’ and ‘hope’ a lot, check in that you are not secretly afraid of failure. Make sure you're not just letting yourself off the hook in advance. Do your best. Go for it, and love yourself no matter what the outcome! THAT is an empowered state. It’s called being committed, but not attached. Even more sneaky than ‘hoping’ is ‘not having time’. News Flash: Everyone has the same amount of time in the day. The same amount of time goes by if we do nothing, or run 10 companies and have a family of 8. What we do with that time is a choice. It may not feel like it in any one particular moment, but ultimately it is. “I don’t have time” means “I am choosing not to make time”. You can tell other people ‘you don’t have time’ if you must, but don’t tell yourself that. Simply admitting the truth that right now, you are choosing how you spend your time can be incredibly empowering. For example there may be perfectly valid reasons why you would choose not to put more time into your horse, or there may be disempowering reasons. That’s for you to figure out. Instead of ‘I don’t have time to ride my horse enough’, you can say: “I am choosing to not make time to ride my horse, AND I don’t know how to find more time to do it.”. That’s fantastic! Go back to Step 5 and celebrate the truth you just told yourself! Whatever you do, don’t get caught in the double-disempowering statement: “I hope I get more time so I can ride my horse more” :-) You will never get any more time than anyone else in the world gets. It’s based on an assumption that the only way to ride your horse more is if someone else gives you more time (which is impossible). The paradox of empowerment is that your biggest power comes from the smallest moments. It comes from knowing your emptiness while practicing your infinite radiance. It comes from knowing your power fully without needing it to be measured in relation to anyone else. So, go ahead and walk across those coals or climb that mountain but know that you don’t need those things to be empowered. Eliminating Sneaky Disempowering habits and language can be just as powerful. Those ‘epic’ experiences have always led me back to the same me that I always have been; knowing something I already knew, but somehow had temporarily forgotten: That I am pretty awesome right now, in my own way. 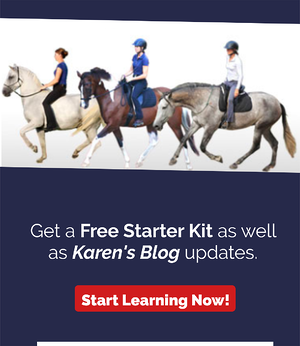 Karen Rohlf is the author of Dressage, Naturally... Results in Harmony: A Guide to the Basics of Dressage from a Natural Perspective. She is known for her step-by-step transformative virtual courses on everything from Horsemanship, to Biomechanics, to Gymnastic Development. You can learn more about those courses HERE. You can check out hundreds of Karen's training videos in her subscription-based Video Classroom. Sign up HERE to get a Free Starter Kit and to get on her mailing list.